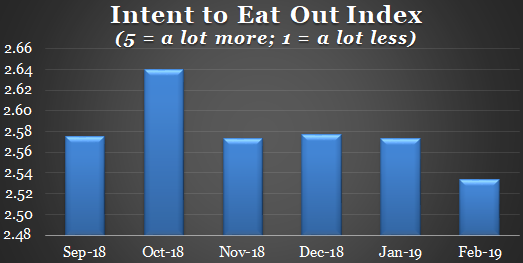 RR Intent to Eat Out Index is at its lowest level since we began conducting this survey 6 months ago. This parallels that QSR value deals as a % of total promotions is at the lowest level in 7 months as the major chains seek to wean consumers off of deals. Similarly, we see a sharp rise from the casual chains in non-price point value deals (promoting things like digital, delivery & kids eat free). Lastly, the IRS reports a 27% decline in the number of refunds through 2/15/19 and an average refund decline of 17% which reflects that consumers under withheld during 2018. 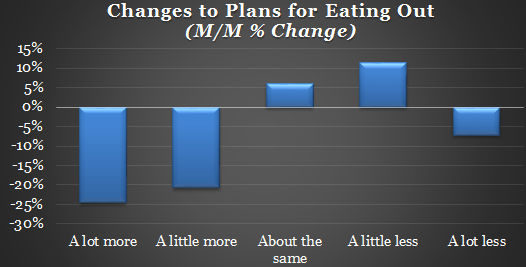 This factor may also contribute to a lower intent to eat out.